Wow! That’s one BIG inflatable hanging ornament! › Who We Are › Our Blog › Wow! That’s one BIG inflatable hanging ornament! Now, we know it's tough to wrap our heads around - but the holiday season is QUICKLY approaching and we are already in the midst of preparing some of our larger decor packages! 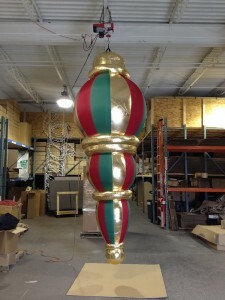 Have you ever seen a 14ft tall 6ft wide hanging Christmas Ornament? We are preparing a large decor package for a client in South America - this brilliant hanging inflatable ornament surrounded by stunning custom draped banners will delight visitors in the central atrium. To learn more about similar innovative and creative decor concepts contact the experts at 1.877.369.6332. We look forward to hearing from you!